When we talk about hardwood flooring, we’re usually think about ¾” thick planks that are 2 ¼” wide. Though you may find narrower widths or a thinner gauge, this is what is considered the classic strip wood floor. Most hardwood flooring today is manufactured from the American hardwoods (red oak, white oak, maple, cherry, white ash, hickory or pecan trees) or the newer exotic hardwoods, such as Brazilian Cheery, Tigerwood, Ipe, African Teak, etc. The three most common hardwood flooring types today are Solid hardwood flooring, Engineered wood flooring and Longstrip engineered wood floors. Traditional solid hardwood floors are comprised of a single piece of wood with tongue and groove sides. Most come unfinished, but there are many pre-finished 3/4" solid hardwood floors. What’s great about solid wood floors is that they can be refinished and recoated multiple times throughout their lifespan — which can be decades or longer. You’ve probably walked on solid hardwood flooring well over a century old that carry that kind of rich patina and character that could tell fascinating tales of the past — if it could talk! Because it’s an natural product, hardwood flooring expands and contracts in response to seasonal changes in moisture. When it’s cold outside and the heat is on inside, the wood can contract — sometimes creating unsightly gaps between planks. 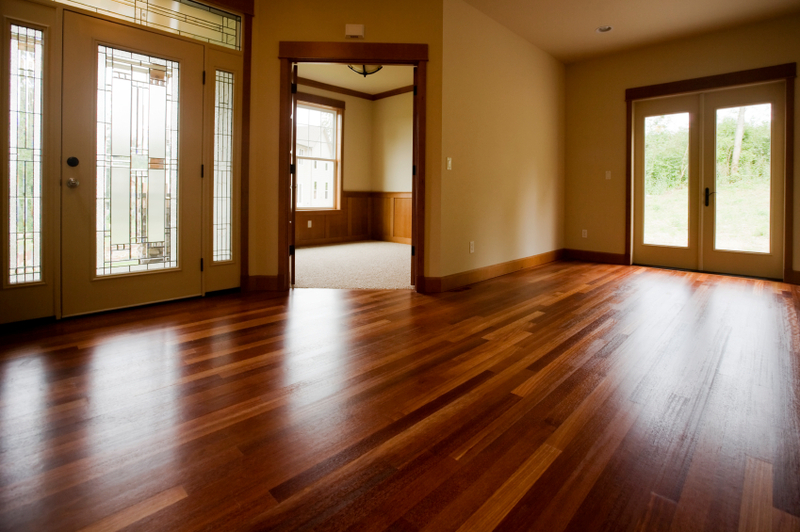 When summer comes and humidity increases, wood floors can expand — causing those gaps to magically disappear! Too much moisture, however, can cause the planks to buckle or cup — not exactly trends in flooring fashion! Oak is typically used to create solid unfinished wood floors. There are several different qualities to choose from — be aware of what you’re buying. Like a flawless diamond, Clear Oak has no blemishes or knots and as such, can be very expensive. You can lower the cost by going with Select Oak or Better Oak, both of which have small visible knots and maybe a little dark graining, as well as some character! #1 Common Oak and #2 Common Oak have more visible knots and more dark graining. Engineered wood flooring has become a extremely popualr hardwood flooring type. Mainly because it can be used in many areas of the home where solid hardwood is not recommended. Engineered wood floors are constructed of 3 or more thin sheets (called plies) of wood that are laminated together to form a single plank. The plies are usually laid in opposite directions (called cross-ply construction) to each other during the manufacturing process. This “cross-ply” type of construction creates a hardwood floor that is dimensionally stable and not affected by changes in moisture and temperature variations like traditional 3/4" solid wood floors. The advantage of cross-ply construction is that the wood plies counteract each other, thus prohibiting the plank from expanding or shrinking. Engineered floors range from ¼” to 9/16” thick and from 2 ¼” to 7” in width. To create a custom look, widths can mixed, such as 3”, 5” and 7” planks installed side-by-side. Lengths are random and range from 12" to 60" in length. Because engineered wood floors are comprised of several layers of wood, the finish of the top layer can be a completely different wood species than the lower layers. You can find engineered wood floors in many different types of wood species, both domestic and exotic hardwoods. Longstrip hardwood floors are really engineered floors with the top, finish layer made up of several thinner wood plies glued together to make a single plank. The center core of a longstrip plank is usually a softer wood material and is used to make the tongue and groove. The top layer can be almost any hardwood species and is comprised of smaller individual pieces that are generally laid in two or three rows. What’s great about this is longstrip planks give the illusion of a board that is 2 or 3 narrow planks wide and several planks long. Each longstrip plank appears to be an entire preassembled section. Longstrip planks come approximately 86" long and 7 1/2" wide. They typically have between 17 and 35 shorter pieces that make up the top layer of each board. This gives the effect of installing a board that is 3 rows wide and several planks long. Longstrip planks are designed for floating installation, but most can also be glued or stapled down. They can be installed over a wide variety of subfloors and on any grade level. You can call us at (305) 945-2973 for individual quotes based on your specific requirements. One of our representatives will be able to assist you in your order.